Morning Brew is lovingly decorated with a combination of modern and rustic details, giving it a welcoming, cosy vibe. The 2 bedrooms feature a queen and a double bed respectively, each with their own ensuite bathroom and deck access. 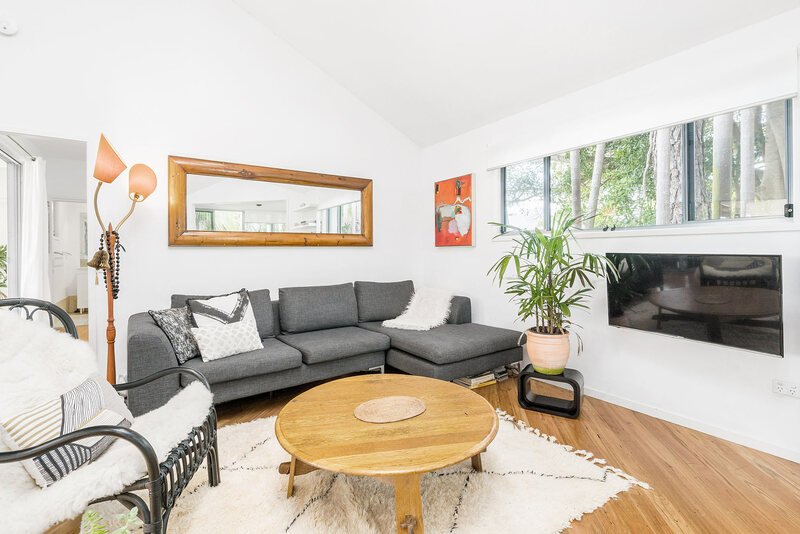 Enjoy ample lounging space with a comfortable couch in the living room, and a sun-filled outdoor deck with view over the lush tropical surroundings. This fully fenced property is kid-friendly and in a great location, backing onto a quiet reserve just a few minutes’ walk to town and nearby beaches. A separate studio is attached to the house, but its permanent residents value their own and your privacy. 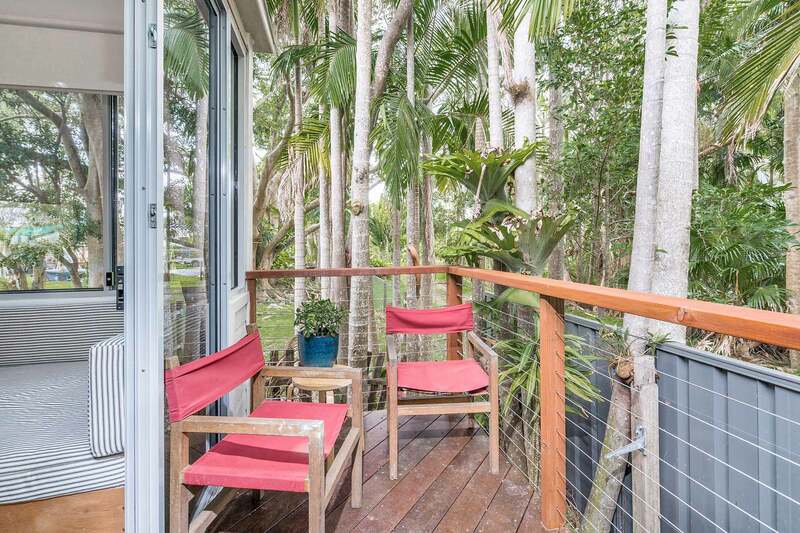 Welcoming you to Morning Brew is a charming outdoor deck overlooking the garden and path. The rustic dining table seats 6 people easily while a cosy daybed is tucked into the corner, creating the perfect perch for a cool summer evening with a great book. 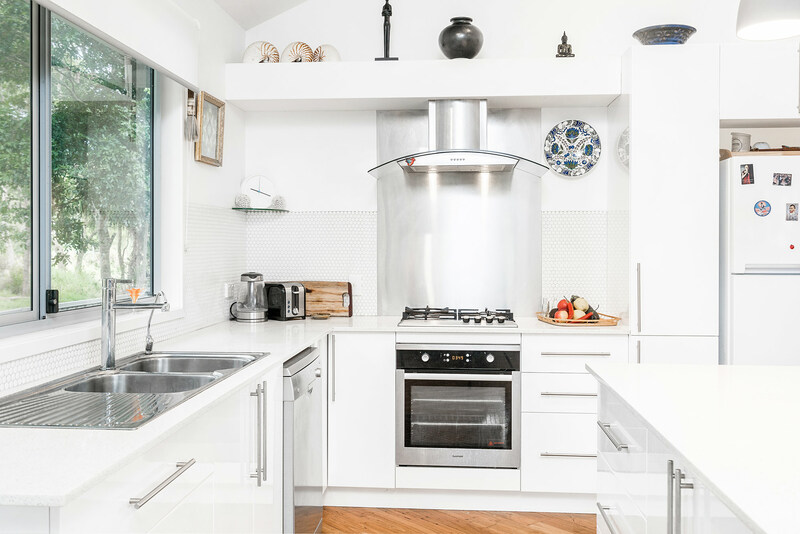 Inside is a bright, modern kitchen which opens onto a comfortable living space with Smart TV. 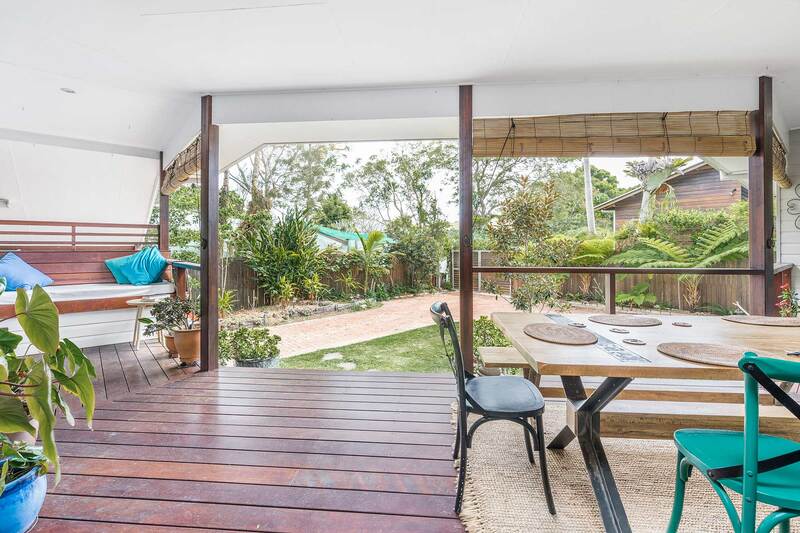 The home’s 2 bedrooms both open into the living space with deck access, each with their own ensuite bathroom. Tropical greenery surrounds the house and garden, which backs up onto a reserve but is fully fenced for privacy and peace of mind. 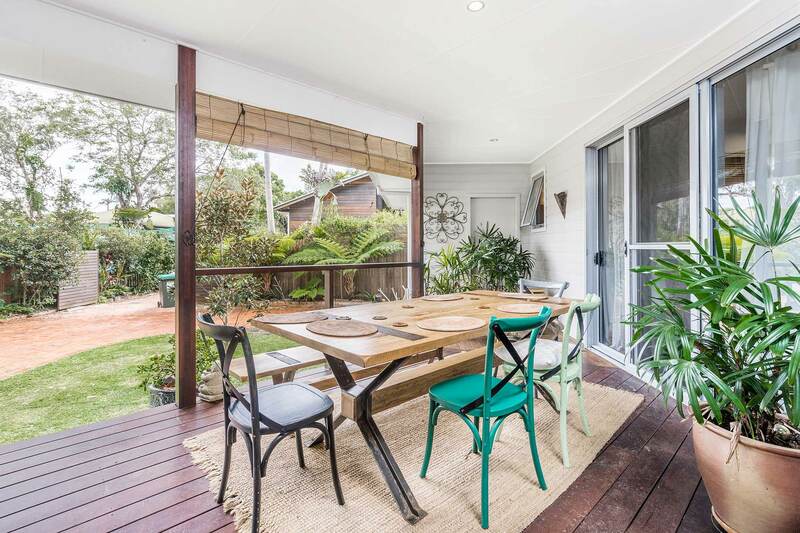 Morning Brew is on a quiet, leafy, residential road just a few minutes’ walk to town. 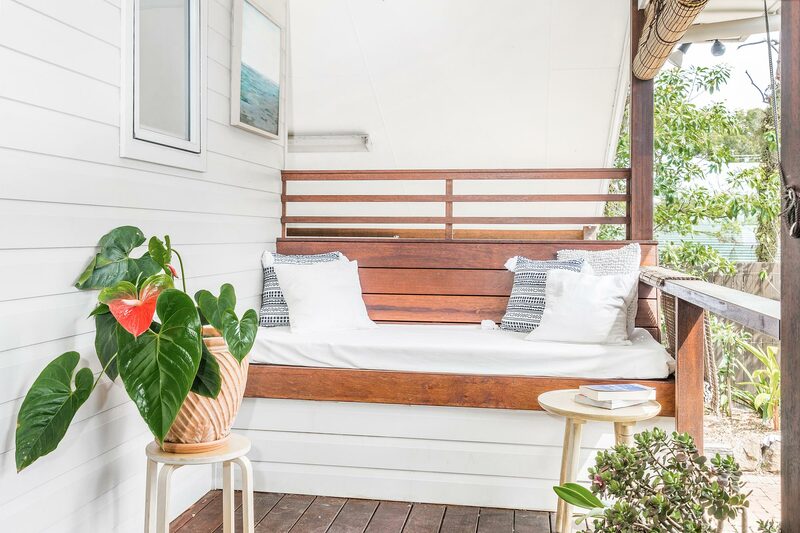 Byron’s world-famous beaches and surf breaks are also within easy reach, placing you at the heart of this vibrant community. Fully-fenced yard. Small pets considered on request. Morning Brew’s cosy living room with comfy couch and flat screen TV with Netflix invites you to stay in for a relaxing movie night. This is truly the heart of the home, open to the kitchen and leading off to both bedroom wings. There is also a sunny, built-in breakfast nook, surrounded by windows and sliding glass doors which lead onto the back deck. On the front deck, another large dining table is available, with an eclectic mix of bench and rustic chair-style seating for up to 6. Cooking with a view on all the beautiful nature around the house is a real joy in this modern kitchen. It is well-equipped and spacious, with sleek, stylish appliances. The centre island provides additional counter space for prepping meals or simply taking a seat on one of the two barstools for your own “morning brew”. If you prefer to cook outdoors, there is a barbecue available on the deck perfect for grilling up meat and veggies on a summer day. 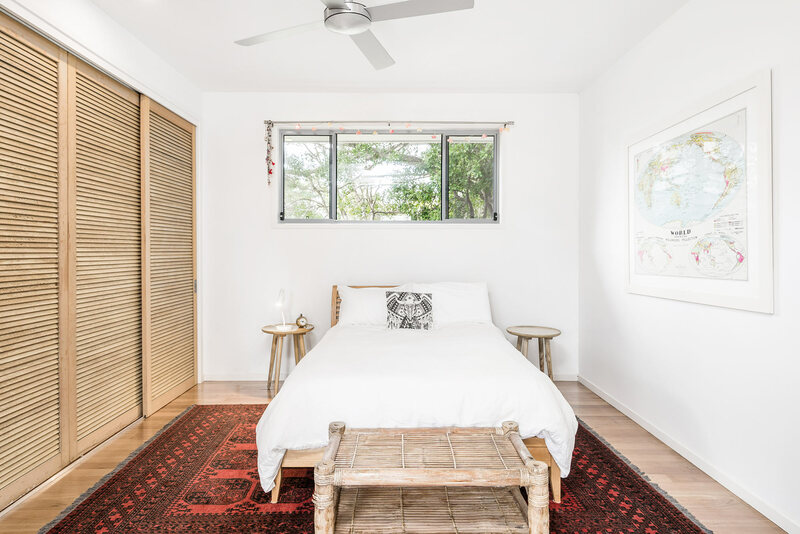 Both bedrooms are lovingly styled with warm, homey touches like a gorgeous Persian carpet and large, vintage world map to inspire your wanderlust. 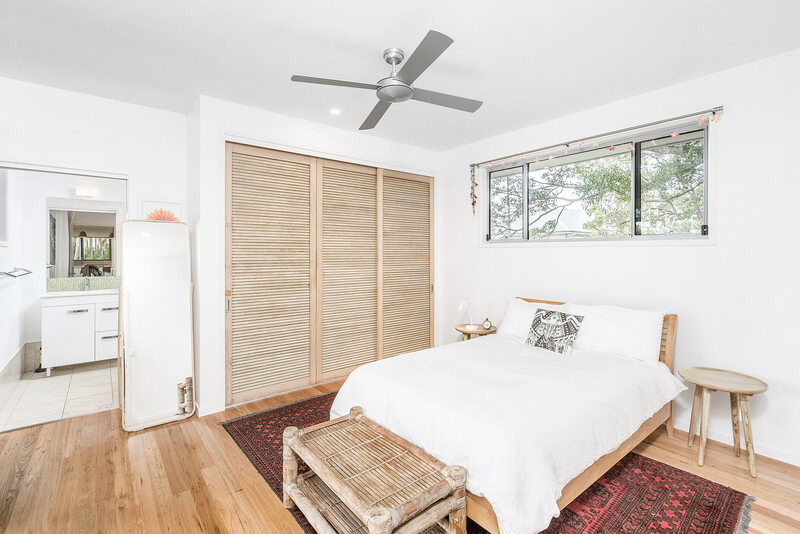 Located on either side of the living space, each bedroom feels like a private retreat with its own ensuite bathroom and access to the outdoor deck. Part of the cottage’s charm is in its two retreat-style bedrooms, each with their own ensuite bathroom. 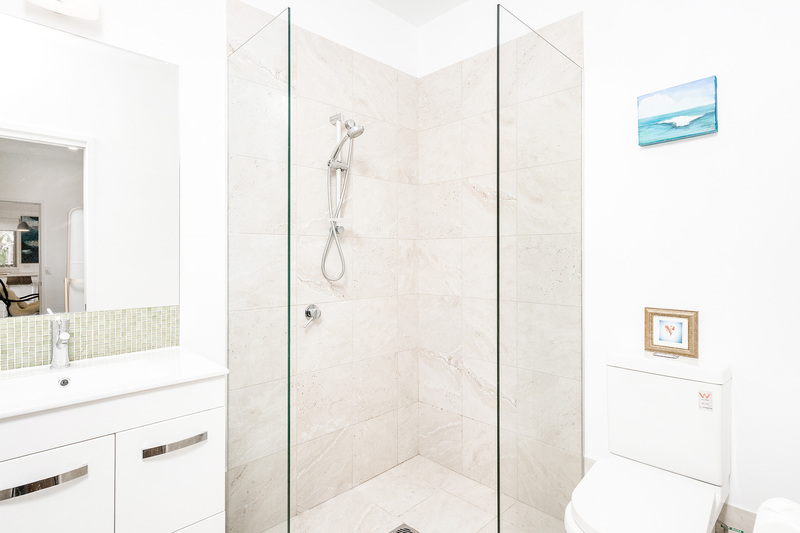 Both are smartly designed with natural light, ample storage space, and refreshing showers. 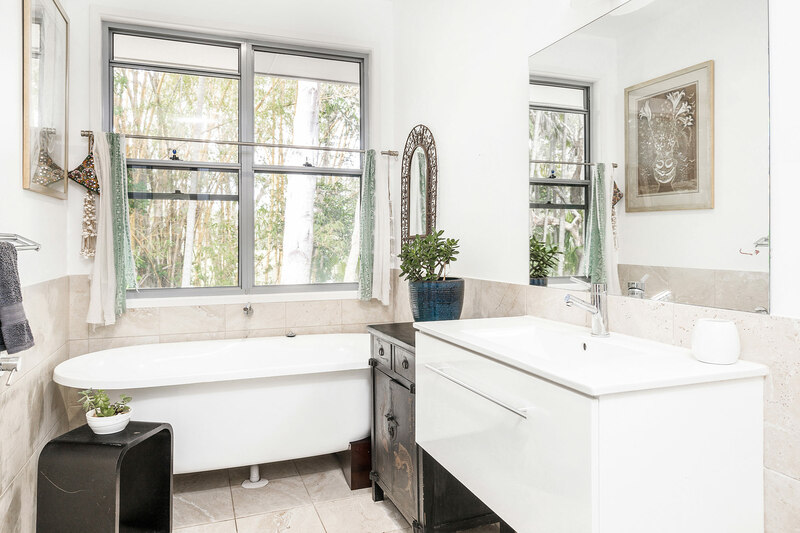 The larger of the two also offers a delightful, claw-footed, freestanding bathtub for the ultimate relaxing indulgence after a long, busy day. An additional hot and cold outdoor shower is located down from the balcony to refresh and clean off after a dip in the ocean. The charming outdoor deck offers additional living and dining space at the front of the cottage. Curl up with a good book on the cosy, built-in daybed or serve dinner al fresco at the 6-seat dining table with rustic bench and chairs. 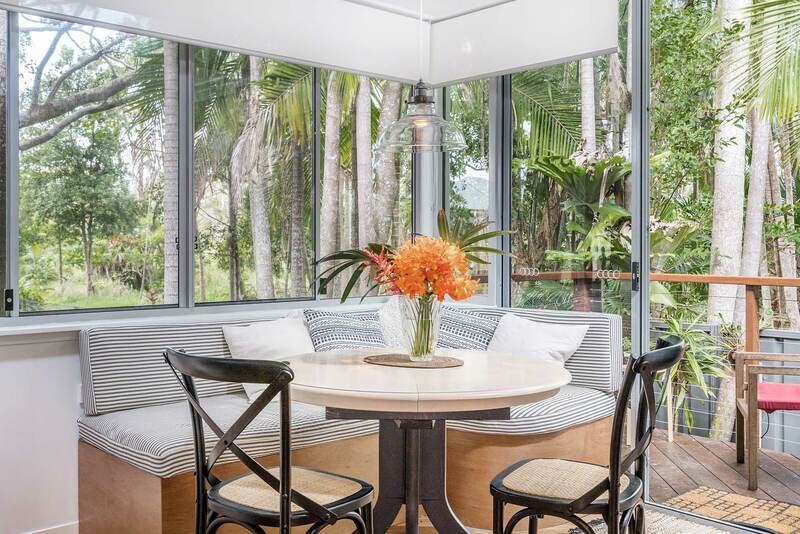 At the back of the house, just off the sunny breakfast nook, is a charming balcony seating space overlooking the lush reserve. The grassy garden is fully fenced for added privacy and peace of mind, making it a great place for kids to play freely. There is a covered carport and off-street parking for 2 cars available. 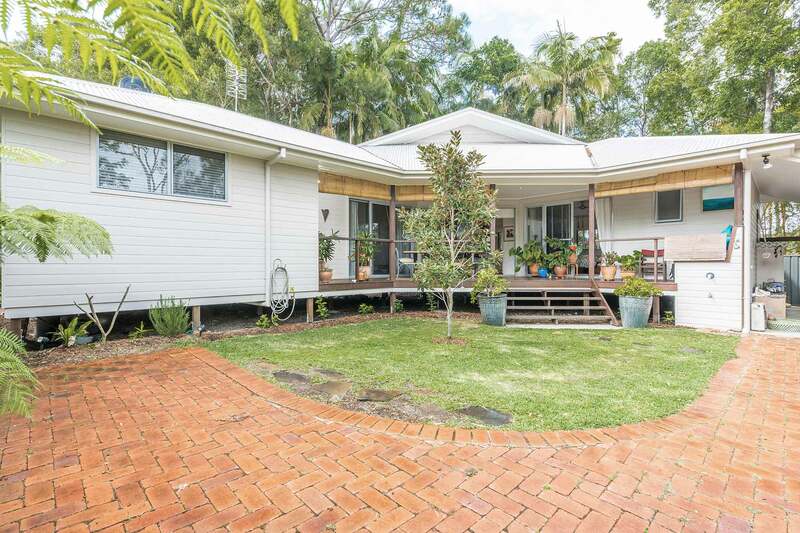 Backing onto a quiet, lush reserve, Morning Brew is on a leafy, peaceful residential road just a few minutes’ walk into the heart of town and nearby beaches. 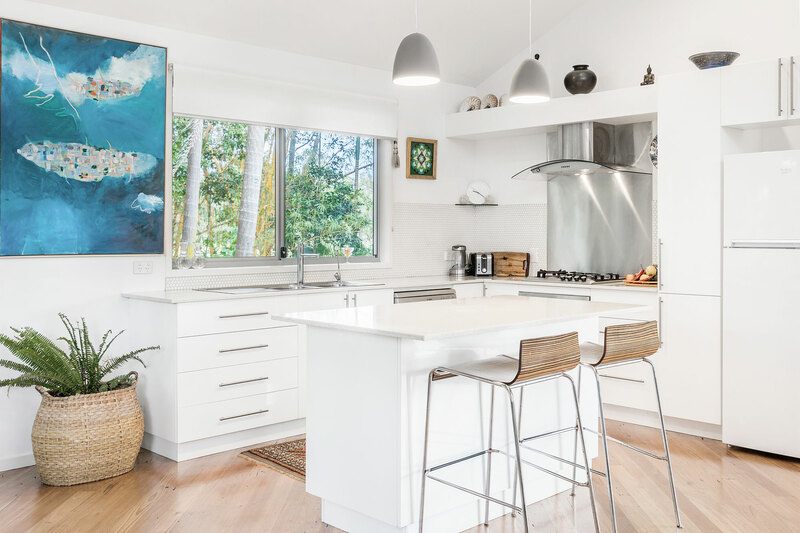 Sunbathers and surfers alike love the pristine white sands and legendary surf breaks in Byron, but there’s more to love here beyond the beach. Take a short stroll into town and discover unique little boutiques, delicious restaurants and cute cafes. 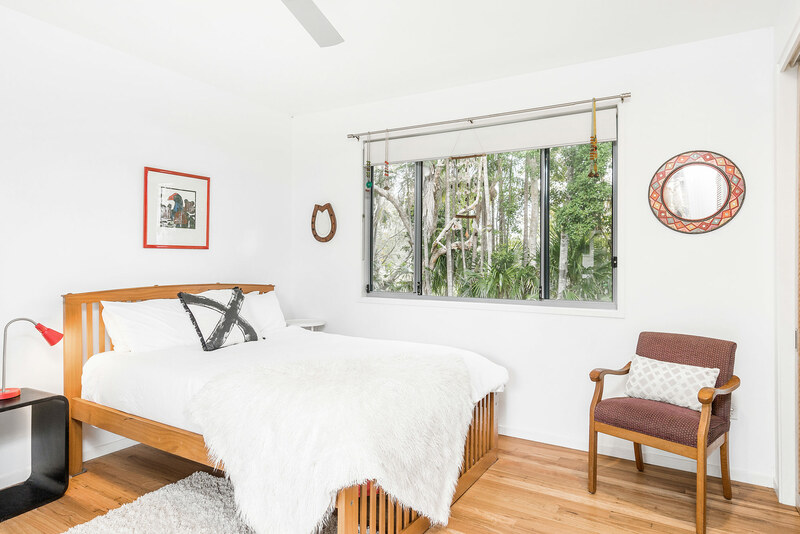 Intimate events, photo/video shoots may be arranged directly with A Perfect Stay/Byron Bay Holiday Rentals/Gold Coast Holiday Rentals. Additional fees and T&C’s apply.